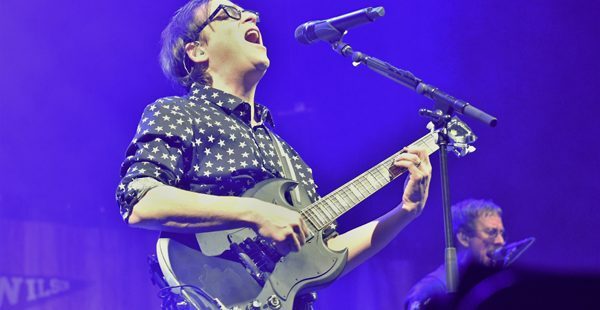 Weezer and Pixies packed Royal Farms Arena in Baltimore Sunday night with the seventh stop on their Spring tour after teaming up for a successful tour last summer. The band, who has historically been rather quiet about their music, has had a recent shift in that regard. Pixies have released a trailer for a podcast documenting the process of making their new album. You can view the trailer and subscribe to updates. The podcast is titled “Past is Prologue,”a sign that they intend to keep this thing going for years to come. The album will be the second released with the current members. 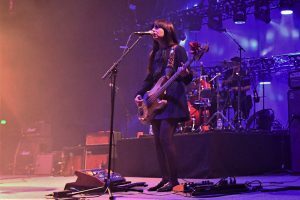 After Kim Deal left the band in 2013, the bass and vocals spot was finally permanently filled by Paz Lenchantin. Their minimalist set design kept all eyes on the high energy of the band members and all focus on the music. In contrast, Weezer’s intricate sets and pyrotechnics show were a sight to behold – everything from a simple diner scene to an enormous spark-showered Weezer “W” behind a wall of fire. 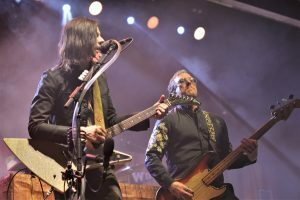 Weezer’s set included songs from nine of its studio albums including its newly released “Black and Teal” Albums. It was all kicked off to a barbershop quartet version of “Buddy Holly” and of course the “Happy Days: intro, as is tradition. The “Teal” Album is entirely covers and appears to be a result of the pressure that came via Twitter in May 2018 for the band to record a cover of Toto’s “Africa,” which earned the band their first No. 1 spot on Billboard’s Hot 100 Alternative Songs for the first time in 10 years. Also from the “Teal” album, the band played “No Scrubs” by TLC for only the second time ever live. Lead vocalist Rivers Cuomo, joked they were “still working out the guitar” for that one. As a kind of break from their traditional sound, Rivers performed acoustic versions of “I Want You To” and Ben E. King’s “Stand by Me” from behind the sound board which of course he travelled to on a raised boat podium sporting the band’s logo on a flag. As Rivers belted out “Stand by Me,” the arena was full of a thick fog that engulfed the stage and most of the floor and illuminated by just about every cell phone flash in the building. The band encored with “Surf Wax America” followed by “Say It Ain’t So” which originally appeared in the same order on their very first (Blue) album. Costa Swanson is a Computer Engineering major at UMBC who has worked for the Baltimore Post-Examiner since 2015. He loves music and sports, especially his Stanley Cup champion Washington Capitals. Contact the author.